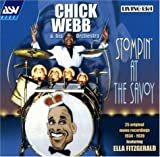 Chick Webb was hugely admired by drummers such as Buddy Rich, Gene Krupa, and Art Blakey for his power, clarity and impeccable rhythm. Unfortunately, the primitive recordings of the time make it impossible to hear his genius. Webb was born with spinal tuberculosis which left him a hunchback and led to his early death. He took up drums on the advice of his doctor as a way of loosening up his limbs. He saved money from menial jobs and bought a drum set with custom pedals to accommodate his small stature. He left Baltimore for New York at 17 and, on the advice of Duke Ellington who was struck by his talent, formed a quintet that would become the famous Chick Webb Orchestra, the house band at the Savoy Ballroom in Harlem. In legendary cutting sessions there, Webb’s crowd-pleasing style and power overwhelmed such bands as Count Basie’s, Fletcher Henderson’s and Benny Goodman’s. Although Webb could not read music, he memorized everything and cued the band with his drums from a raised platform. He introduced “Stompin’ at the Savoy” in 1934, co-written with Benny Goodman, Edgar Sampson and lyricist Andy Razaf, and had hits with “If Dreams Come True” and “Blue Lou.” In 1935 he hired a young, unknown vocalist, Ella Fitzgerald, with whom he recorded over 60 songs, most notably “A Tisket, A Tasket” (Fitzgerald’s own composition) which went to the top of the charts. As Webb’s health began to deteriorate, he continued to perform with indomitable spirit, often passing out after a set. Upon his death Fitzgerald took over the orchestra for two years until it became too much for her, and the orchestra disbanded. The much-loved Webb was eulogized by Fitzgerald singing “My Buddy” at the funeral which could not accommodate all of the mourners.